MIET AFRICA’s Uthukela Inclusive Education in Action Project is field-testing the KZN Department of Education’s three-tier system for Inclusive Education. Three schools in the Uthukela District are involved, each representing one of the levels of support offered to learners experiencing barriers to learning. 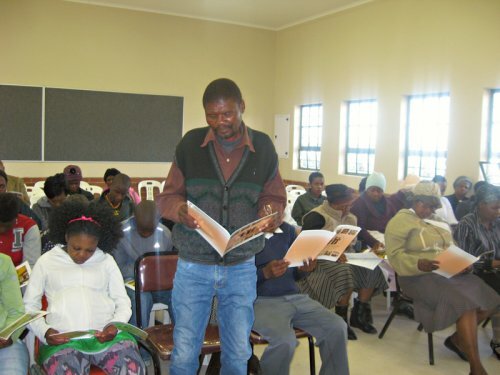 Lokothwayo Combined is the mainstream school, offering low levels of support. Madlala is the full-service school, which offers moderate levels of support. And Inkanyezi, the Special School as a Resource Centre, offers high levels of support. The field-testing entails building the capacity of schools, parents and communities to support all learners, especially the vulnerable, to access school, to stay at school and to achieve at school. The project is currently conducting special training sessions for parents and caregivers, which focuses on them having strong relationships with their children. The parents and caregivers attending are responding positively to the idea that they can build their children’s self-confidence, that they can play a positive role in supporting their children’ss education. The training also seeks to empower all parents, including those with low levels of literacy: it dispels the myth that they cannot play an active and supportive role in the education of their children. Parents and caregivers – you can support your children’s education. What you do does make a difference! ← Trying to keep girls in school!